Where are your kids? Where have they been? 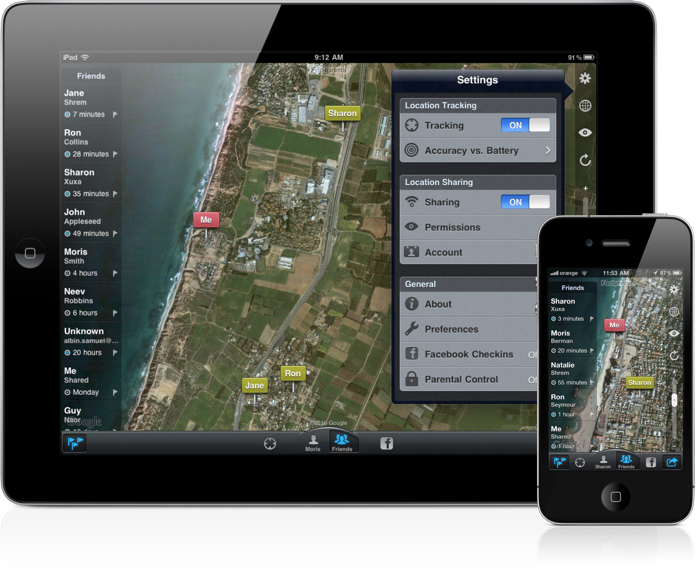 With Footprints, you can track your kids and share locations with family and friends, anytime, privately. It all happens automatically, whether your phone is in your hand or in your pocket. All in a beautifully clear and simple interface. Now, parents can keep track of their children's whereabouts and see where they have been, couples can know that their loved ones arrived safely at their destination, friends can locate each other, and even managers can find and keep track of employees in the field. 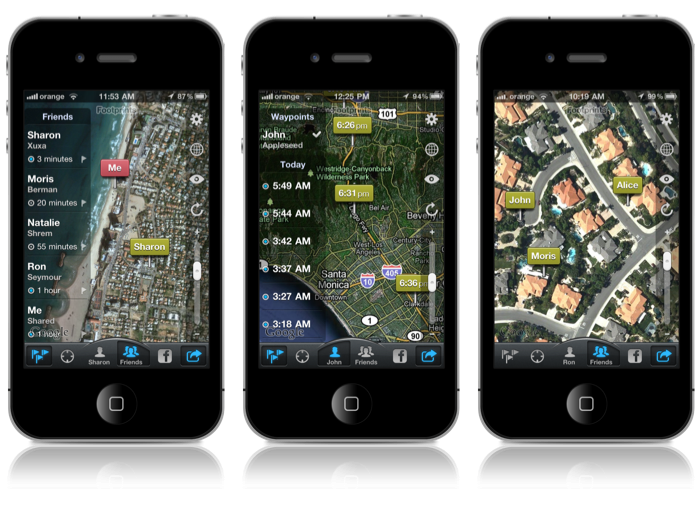 Footprints tracks and shares locations automatically – in real time, all the time. And it does it privately. It's really different from other apps that simply show the current location or require some kind of manual operation to share locations. With Footprints, you can set up Geofences, like your kids school, and be notified when these fences are crossed. You can even activate movement sensors that will notify you each time your loved ones are on the move. ✔ Tracks movement throughout the day and logs waypoints without user intervention. ✔ Parental control feature allows for sharing locations at all times, without a disabling option. ✔ Lets you share waypoints by granting specific permissions. For instance, you can share your last 10 waypoints with a friend for two days. ✔ Geofence and movement notifications can alert you when someone moves or crosses a fenced area. Speeding notifications can alert parents when their teenagers go over the speed limit. ✔ Designed to sync seamlessly between your iPhone and iPad. ✔ App runs in the background – without draining your battery – by leveraging Apple's Significant Location Change technology, which monitors location changes as your device “sees” new cellular towers. (Footprints typically logs a waypoint when there is movement of 500 meters to 3 km or a quarter-mile to 2 miles, depending on cellular coverage in the area.) This default setting provides a good balance of timely location updates without draining the battery. ✔ Check-in to Facebook Places and map where your Facebook friends are checked in. Map your Footprints and Facebook friends together, so you can always see where everybody is. ✔ Initial free subscription period makes it easy to get started. ✔ Requirements: iOS 8.3 or later. Footprints must be installed on all devices tracking or sharing locations, and each device must have a valid subscription. Runs natively on all Apple iOS devices from the 3rd generation on (iPhone 4S and later, all iPad models). ✔ Tracking Disclaimer: Devices without a GPS and cellular connection (iPad Wi-Fi, iPod touch) can only track and share waypoints when connected to a Wi-Fi network. Fixed problem with non-English characters in Geofence and Contact names. iOS 7 has changed the way Footprints tracks in the background. In iOS 7, when Footprints is killed by the user from the new App Switcher (by swiping up), Footprints will no longer track until it is manually launched again. This is different than iOS 6, where even if the app was killed from the app switcher it would have been automatically launched again. Apple made this change to protect its users, so that any app that is killed by the user is no longer automatically relaunched. In the case of Footprints, however, kids can now easily disable background tracking by killing the app. We hope Apple reconsiders this new policy in future updates. In the meantime, please ask your kids not to kill Footprints from the app switcher.